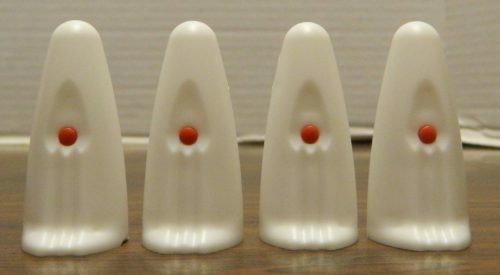 Originally created in 1980, Ghosts! was designed by Alex Randolph as a children’s bluffing game. 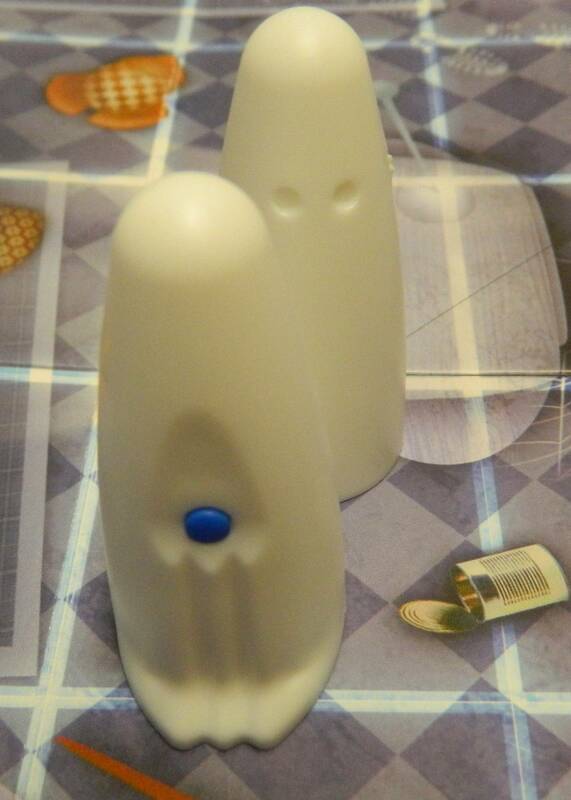 Each player is given a set of good and bad ghosts whose identities are hidden from the other player. Through bluffing a player needs to either keep their good ghosts, have their opponent take all of their bad ghosts, or get one of their good ghosts to the other side of the board without it being captured. Since 1980 the game has been re-released a couple times with the name changing a couple times. In 2013 it was re-released as Phantoms vs Phantoms by Asmodee. While I was a little worried about the game being a little too childish, I decided to try out Phantoms vs Phantoms because the game’s premise sounded interesting and it actually has good ratings for a children’s game. Phantoms vs Phantoms has some interesting gameplay mechanics but some issues lead to an overall flawed experience. 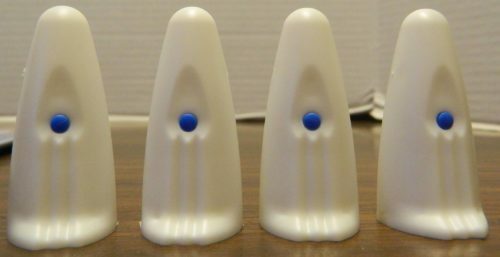 Each player is given four good ghosts (blue marker on the back) and four bad ghosts (red marker on the back). 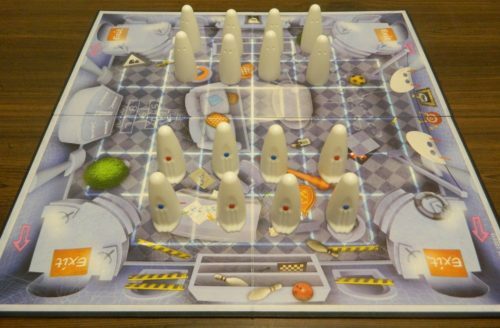 Both players arrange their ghosts on their side of the gameboard in whatever order they want creating two rows of four in the middle of their side of their board. The ghosts are turned so the marker on the back faces the player that controls the ghost. On a player’s turn they will move one of their ghosts forward, backward, left or right one space. Ghosts cannot be moved diagonally. This player has moved one of their ghosts forward one space. If a player moves one of their ghosts onto a space occupied by one of the other player’s ghosts, the player who moved the ghost will capture the other player’s ghost. The player who captured the ghost places it off to the side of the board so they can see the color of the marker on the back. This ghost was moved onto a space occupied by another ghost. This player captures the ghost that was already on the space. Phantoms vs Phantoms ends when one of three things happen. If a player captures all four of the other player’s good ghosts, they win the game. This player has captured all four of the other player’s good ghosts. This player has won the game. If a player captures all four of the other player’s bad ghosts, they lose the game. This player has captured all four of the other player’s bad ghosts. This player has lost the game. 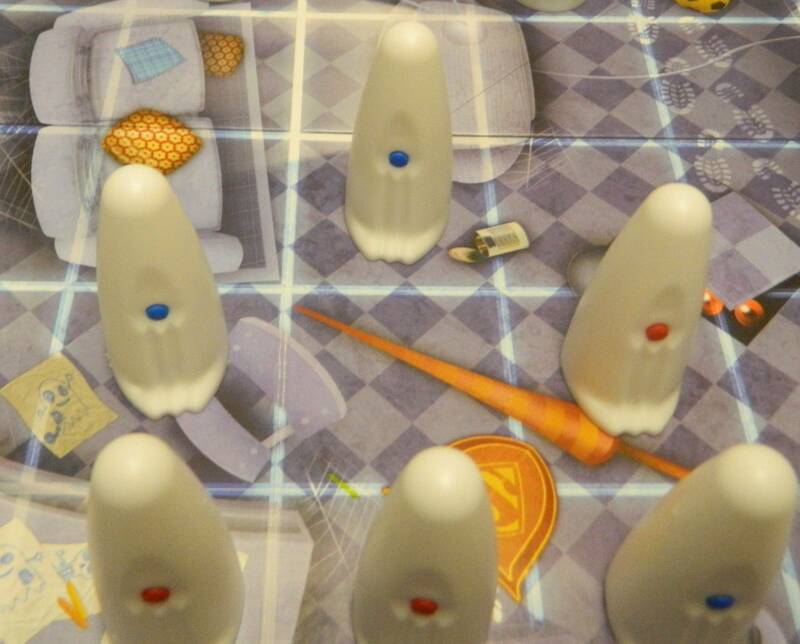 If one of the players are able to move one of their good ghosts to one of the exits on the other side of the board, they win the game. This player has moved one of their good ghosts to the other side of the gameboard to win the game. Dating back to the early 1900s, Stratego is probably one of the first bluffing/deduction games. For those of you who have never played Stratego before the basic goal is to find and capture the other player’s flag. Each player has an army of pieces that have different strengths. When two pieces battle usually the stronger piece will win and the other piece is removed from the board. The identity of each piece is hidden from the other player until the piece is part of a battle. Thus players have to use their intuition to try and determine the identity of the other player’s pieces. You might be wondering why I am talking about Stratego in a review of Phantoms vs Phantoms. I am bringing it up for the simple reason that I would consider Phantoms vs Phantoms to be a simplified version of Stratego. It basically feels like Alex Randolph took Stratego and streamlined it to the point where it was more accessible to children. Instead of 40 pieces he reduced the number to eight. Also instead of having different strengths any ghost can take any other ghost. The catch is that some ghosts you want to capture while there are other ghosts that you don’t want to capture. Phantoms vs Phantoms also gives you three different ways to win the game instead of the one way you can win in Stratego. 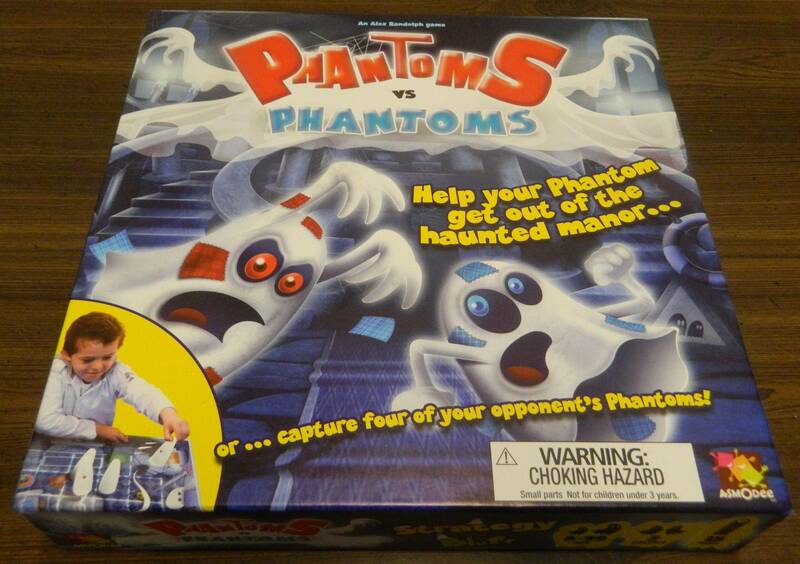 As Phantoms vs Phantoms was made for children the game was made to be simple to pick up and play. In that regard the game succeeds really well. The game has a recommended age of 8+ but I see no reason why kids under eight couldn’t understand the game. They might not understand all of the strategy behind the game but they shouldn’t have any troubles actually playing the game. The game is also quite short with most games only taking around 10-15 minutes so younger children shouldn’t get bored while playing the game. Basically Phantoms vs Phantoms only has one mechanic but there are different strategies you can pursue in the game. There are three different ways of winning the game and each can lead you towards a different strategy in the game. First you can try to capture all of the other player’s good ghosts. With this strategy you are likely going to try to capture every ghost that you can. You might want to be a little cautious though because the other player might be using the second strategy of baiting you into capturing all of their bad ghosts so you lose the game. If neither of these strategies appeal to you there is always the option of trying to sneak one of your good ghosts to the other side of the board. For this strategy to work you either have to trick the other player into thinking a good ghost is a bad ghost or you need to use other ghosts to clear a path to the exit. In reality you can’t solely follow any of these strategies. You will likely have to blend the different strategies together based on what the other player does. The key to winning Phantoms vs Phantoms is figuring out what your opponent is doing and implementing a strategy that counters it. Generally I don’t have high expectations for strategy when it comes to children’s games but I have to admit that I was kind of surprised by Phantoms vs Phantoms. The game will never be confused for a highly strategic game but it has more going for it than most children’s games. Without a doubt the biggest problem that I had with Phantoms vs Phantoms is the idea of known knowledge. What I mean when I say known knowledge is that in board games there is a spectrum of how much information each player knows and how much information is hidden. For example in a game like Chess there is basically no hidden information. You don’t know what the other player’s strategy is but there are no hidden pieces or information that only one of the players have access to. On the other hand of the spectrum there is a game like Stratego. I would place Stratego pretty high on the spectrum for hidden information. You know what pieces the other player still has but you don’t know which piece is which. The only way to figure out the identity of a piece is to battle it or to infer whether it is strong or weak based on how the other player moves it. The problem with Phantoms vs Phantoms is that it has all of the hidden information of Stratego and adds even more information on top. In Phantoms vs Phantoms there is only one way to get definite information about the identity of a ghost, capture it. Until you capture a ghost the only information you can gain about a piece is based on how a player moves it. The other player knows this so they can easily bluff that a piece is the opposite of what it actually is. Most games give you some information that you can use to make an educated guess. Phantoms vs Phantoms basically gives you no information. This means that the game mostly relies on luck. You need to get lucky that you find the other player’s good ghosts while avoiding their bad ghosts. The only way to get around the guessing aspect of the game is being able to read the other player. Maybe it is just me but I have never been a fan of board games that rely heavily on you being able to read the other players. Maybe I am just bad at reading people but in Phantoms vs Phantoms the outcome of the game relies almost entirely on reading the other player or doing a good job of guessing. While I like that the game gives you multiple different ways of winning the game, it seems to also exacerbate this problem. For example a player could start moving one of their ghosts towards one of your exits. This could either mean that they are trying to win by getting one of their good ghosts to an exit or they could be trying to trick you into capturing one of their bad ghosts. Unless you can read the other player you are basically forced to guess what you think the other player is doing. Because of this problem I would say Phantoms vs Phantoms is more of a game for younger children and their parents than adults. Younger children aren’t going to care that the game mostly relies on guessing well. With how simple the game is to play I think younger children would actually enjoy the game quite a bit. Meanwhile the guessing aspect is not going to appeal as much to adults. The bluffing mechanic would have been fine if there was more to the game but that is basically all there is. Unless you are really good at reading the other player the game basically becomes a guessing game which is going to turn off a lot of adults. While I can’t comment on the components for the other versions of the game, there are some things I like and don’t like about Phantoms vs Phantoms components. On the positive side I like the ghosts. The ghosts are pretty cute and are pretty sturdy. I think the biggest problem with the components is the board. The artwork on the board is fine. The problem is the board just feels kind of cheap. I purchased a new copy of the game and yet the board still doesn’t lie completely flat. If the board was of a higher quality I don’t think this would have been a problem. Should You Buy Phantoms vs Phantoms? I am kind of conflicted when it comes to Phantoms vs Phantoms. There is a lot I like about the game. For such a simple children’s game it actually has more strategy than I was expecting. I also liked that the game has three different ways to win the game. The problems that I had with the game basically come down to the fact that you are never given enough information in the game. You are given next to no information which makes the bluffing mechanics rely entirely on luck and being able to read the other player. If you can’t read the other player you basically have to be lucky to win. While this probably won’t bother younger children I think it will annoy adults. If you don’t love bluffing games especially ones that rely mostly on guessing, Phantoms vs Phantoms is not going to be for you. 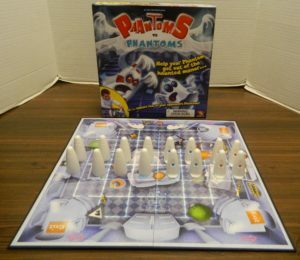 If you are looking for a bluffing game for younger children though I think it might be worth looking into Phantoms vs Phantoms. I have a copy of a 2011 critique of “Ghosts” by Chess Grandmaster Raymond Keene. I would like to share it with you. However, it is a pdf file and I am unable to attach it. Please contact me if you would like me to send it to you. Phantoms vs Phantoms AKA Ghosts! A simple pick up and play bluffing game. Has more strategy than I expected from a children' game. The game has too much hidden information. Unless you are good at reading other people, the outcome boils down to guessing.